Moriyama, Kiroku -- Record No.6, Nagasawa Akio, 2006, wrap-around cover (fig.E). Silkscreening was a natural outlet for the innovative Moriyama and he taught the process alongside photography at WORKSHOP Photography School (1974-76). 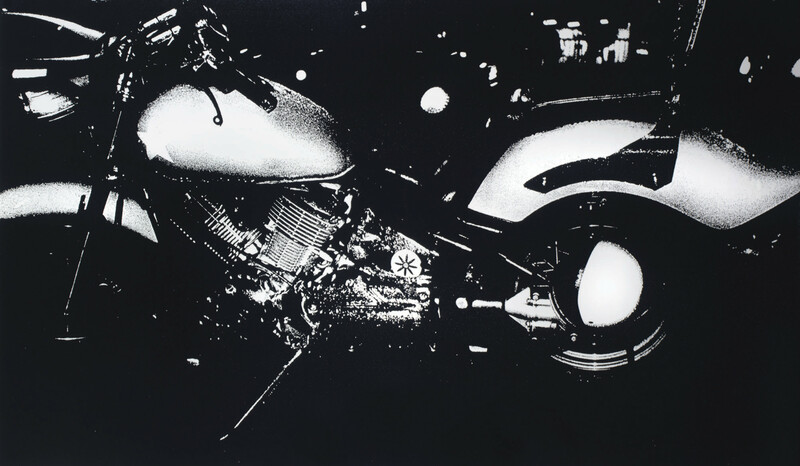 In this recent work, he harks back to the Harley Davidson motorcycle, the subject of his first solo exhibition devoted to silkscreens in 1974 (fig.1). He selected this photograph as the wrap-around cover image for the sixth issue of his recently resumed photo journal Record. From July 1972 to July 1973, Moriyama self-published five issues of Record.